Hybrids are becoming more and more popular, and plug-in hybrid sales increased by an impressive 628% in 2014. One day we'll all have a plug-in vehicle of some sort, but if you don't know what they're like to use, they're still a bit of a mystery. So how do they work in the real world? Open the door, get in, turn the key. The first thing that hits you is that it's super quiet. When you twist the key in the ignition it's like nothing happens. The only way you know the car is on is because you look at the dash and the needle in the battery dial points to 'Ready' and the rev counter needle is at '0'. 3. Do I need to do anything else? Nope, now you can start driving. In the dial on the right you can see how much 'E-Power' you have, but obviously – as with any other car – the harder you drive the quicker the charge will deplete, so the maximum you can get on battery alone hovers around 15 miles. If you're booting it up hill, for example, then the battery will run out more quickly than if you're in town stuck in stop-start traffic. Really quiet. On battery power alone you have to be especially careful when driving around pedestrians, as they won't hear you coming. If you're driving around the supermarket carpark for example, then be hyper aware of the fact that everyone you see is subconsciously only listening out for engines, not Cars of The Future. So, assume that they're going to just walk across in front of you. 5. Does it switch between battery and the normal engine? In the Porsche there's a large battery which is good for about 90bhp, that you can use to drive about in any conditions up to the 60mph mark (although going down hill we've done 70mph on the battery), and then there's also a 3.0-litre V6 producing over 400bhp. If you're running around on the battery and get into the sort of situation where you have to bury your foot through the floor – say you're overtaking – then the car will switch to the petrol engine, and if you're really in trouble, then it can enter the 'Boost' setting and use the petrol and battery together for maximum performance. In every day, if you're in battery mode and go beyond 60mph then the petrol engine will come on line and you'll drive it like normal. 6. So the miles per gallon is great, right? Well, yes and no. This is where those huge mpg figures start to really confuse consumers. Porsche's numbers on their official stats sheet say '80mpg' which seems immense, but in the real world that isn't quite so representative. Obviously when you're cruising on the battery you're not using any gallons, but in petrol-only mode on the motorway, you've just got a regular huge car made heavier by a massive battery, so the mpg figure is painful for anyone outside of a well-heeled businessman or monied footballer. 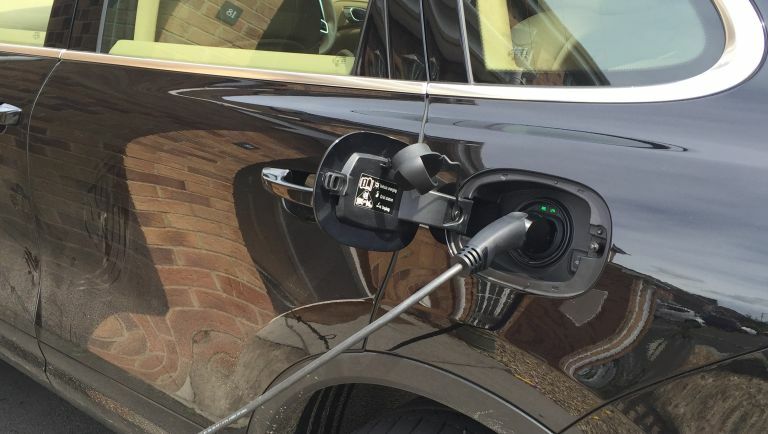 So if you can make the most of the battery power then the Porsche is a dream to use – well built, premium badge, great looks – but if you're doing lots of motorway miles and don't have money to burn, then it's more just a fascinating exercise in very clever tech. 7. But that's just the Porsche? Other hybrids aren't that thirsty? No hybrid is particularly more economical on the motorway over anything else, as there's no real recuperation – you're still using a fossil fuel to drive. Where hybrids come into their own is when you can drive them about on battery alone. So that then leads to the question: why doesn't everyone just buy a full plug-in? Which we'll explore next time!